Rory and I are starting to think through what we want the nursery to look like. 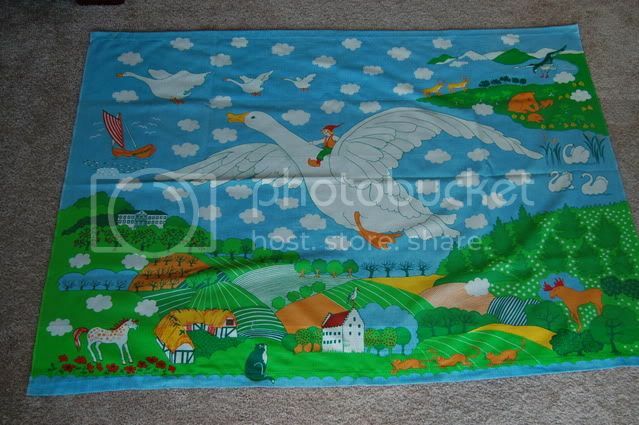 This was the wall hanging in my nursery growing up...and I think it was still on my wall well into elementary school. I used to stare at this picture forever, drifting off to sleep or just as I was waking up. There was always something to look at, wonder about and my imagination made up all sorts of stories to go with the different scenes. Super cute! Will you use this in your baby's nursery, as well? Yes, I really want this to be a part of our baby's nursery...the trouble is that the walls are "stormcloud grey" (any guesses on who picked the paint color?!!) and I'm not sure how it would all look together...but the plan for now is that it would be hung above the crib. And Beth, YES. We'd love your help. We're moving in on a work day, but maybe that weekend or the weekend after we could have you over for an unpacking boxes party... Mostly, I just want to see you.